About Us &sol; Blog &sol; Uncategorized &sol; Getting you through whatever winter throws at you! 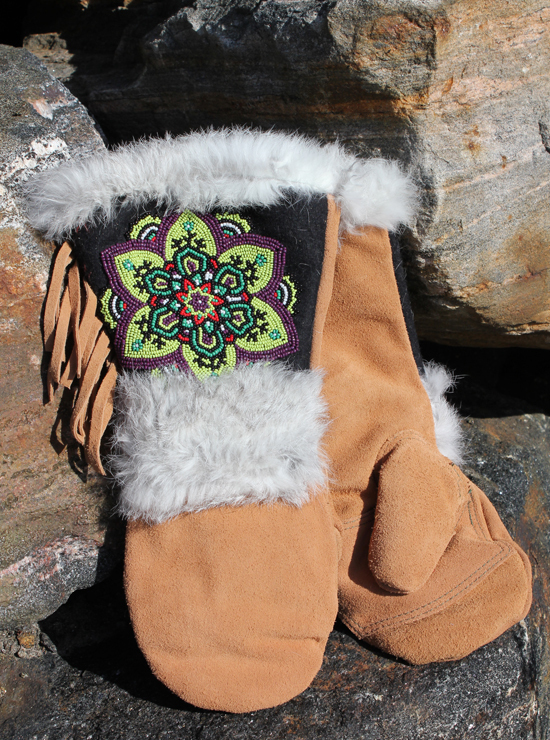 We’ve just unpacked some of these gorgeous mitts! They are stunning, but you’ll appreciate the high-tech quality. Made by Astis, they are lined with dry-wicking Polartec Thermal Pro High Loft to keep you warm and dry, whether on the slopes or walking the dog. The leather is tanned with an injection of silicone, making them more waterproof, but keeping them soft and supple for maximum dexterity. They are designed to be wide enough at the cuff to slip your jacket sleeve inside comfortably, and there are no buckles or snaps to fuss with. And then there is the beadwork….they are hand-stitched in several vibrant designs. Rabbit fur trim and a fringe take them over the top. They won’t require a lot of care, but follow these tips and they should give you years of wear. They might even be the last mitts you ever purchase. High-tech and beautiful – if winter is your season, you need these!